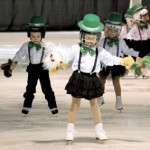 PHOTO BY TIM KALINOWSKI- The PreCanSkaters used hand puppets and a St. Patrick’s theme in their skate. Adorable! PHOTO BY TIM KALINOWSKI- The Redcliff Skating Club celebrated its 40th season with its ice carnival on Sunday. It was a packed house and the performers did not disappoint. Pictured, from left: Kaylea Suderman, Cassandra Forbes, and Jordan O’Sullivan give a Cirque du Soleil themed skate. PHOTO BY TIM KALINOWSKI- Alexis Wilberg gave a beautiful opening performance in the opening act.